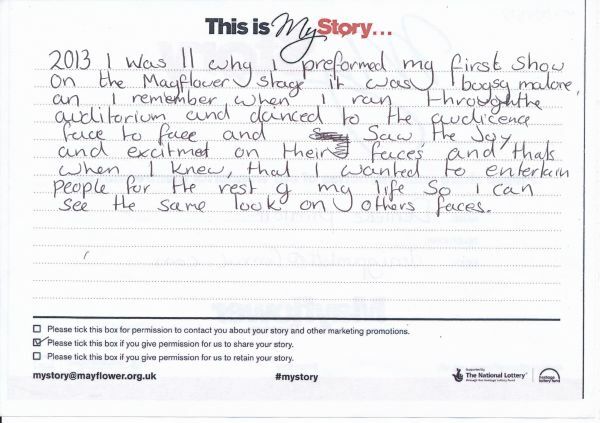 My Story card: Denielle Pimlott remembers performing in the auditorium during Summer Youth Project's Bugsy Malone. In 2013 I was 11 [when] I performed my first show on the Mayflower stage, it was Bugsy Malone. And I remember when I ran through the auditorium and danced to the audience face to face and saw the joy and excitement on their faces and that's when I knew that I wanted to entertain people for the rest of my life, so I can see the same look on others' faces.